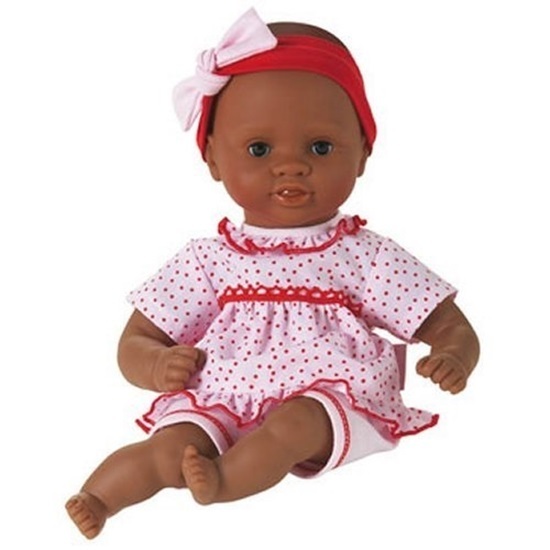 Realistic details , soft huggable bodies, and high quality materials are just one of the reasons to have a Corolle baby doll. Thanks to her cuddly soft, bean bag body, Calin Naïma can be posed just like a real baby. She is 12 inches long and is machine washable in cold water. Naima is African-American with brown sleep eyes. She is wearing a pink 2-piece outfit with red polka-dots on the top and red stitching around the pant legs. A red headband accemted with a pink bow is worn on her head. For ages 18 months and up.